Most of you know that a lot has happened to our family over the last two weeks. To make a long story short, Trey and I became the proud parents of two precious girls, Layla Jane and Jenna Louise. Unfortunately, I've never been one to make a long story short, so I will attempt to be as brief as possible while trying to catch you up on how this miracle came to be. It all started a little over two weeks ago on Wednesday, March 10, 2010. I had a doctor's appointment for my regular 35 week checkup. After a very short exam, my doctor dropped the bombshell that we needed to schedule delivery of the twins for tomorrow! What?!?! This was two weeks before my scheduled c-section date of March 25th. Why did we need to do this now? My doctor felt pretty strongly that the girls were on their way and could show up at any moment. She recognized that delivering at 35 weeks would put the babies at risk for possible complications or NICU time, but she thought it was more important to schedule the delivery under a controlled environment, where she could ensure she would be there, she would have ample time to prepare, she would have her choice of a doctor to assist, her pick of nurses to be present, the nursery/NICU would be prepared for premature twins, etc. Apparently, twin deliveries are considered high-risk and any factor that you can control increases the probability of a healthy and safe delivery. Basically, the situation was that the babies may not have been quite ready, but my body was not going to take any more. The safest thing to do was to take them ASAP. My mom and sister drove through the night to be here for the early morning surgery. We were to report at the hospital at 7am on Thursday, March 11th for surgery prep. Trey's mom met us there. We all spent a couple of hours in the pre-op room and around 9:30, I was wheeled into the operating room. Trey joined me shortly after. It didn't take long for the show to begin and for Layla and Jenna to make their debut into the world. Layla weighed 4 lbs and 7 ounces and measured 18" long. Jenna weighed 5 lbs and 2 ounces and was 18.25" long. They were born at 10:01am and 10:02am, respectively. They were beautiful and seemed to be doing just fine. Layla was quiet and calm and Jenna was a basket case! Trey, the babies, and several nurses left the O.R. and headed to the nursery. I was so excited that they were healthy! The next stop for me was the recovery room. This is where I would spend the next 3 days mending from the surgery and spending time with my babies. It didn't take long before my family and a few friends joined me and eventually, Layla was brought to the room too. Trey informed me that Jenna was sent to the NICU due to a few breathing issues she had, but she would be fine. I was devastated, but everyone seemed to be in good spirits about it, so I tried not to worry too much. Seeing and holding Layla was amazing, but unfortunately, I was very sick from the anesthesia, so I wasn't able to participate much in anything. Being too ill and still hooked to several monitors, I wasn't able see Jenna on the first day, however, Trey and all my other family members did visit her several times that day. By the end of the night, I was starting to feel better. March 11th was a very long day! The next day was emotionally draining. I was learning more and more about Jenna's condition and chomping at the bit to go and see her. We received a lot of information about how she was doing. To spare you all the details, she basically had under-developed lungs that were not absorbing enough oxygen, nor releasing enough carbon dioxide. They had to give her oxygen supplements and she briefly spent time on a ventilator. They also discovered that she may have taken a swig of amniotic fluid before she was delivered which was contributing to the problem. She had lots of fluid in her lungs, so they put her on diuretics, which eventually caused her to drop from 5.2 lbs to 4.2 lbs. As the day went on, she had more and more IV's, tubes, monitors, etc added to her regimen. When I finally got to see her, it was awful. She looked so helpless and pitiful laying in the warming bed. We weren't allowed to touch her or hardly even talk to her. It was more than I could handle. Fortunately, Jenna began to show improvement quickly. It seemed that every time we went to visit her over the next couple of days, she had fewer and fewer medical devices attached to her body and the reports from the nurses and doctors were generally positive. Eventually, we were able to touch and even hold her. From pretty early on, we knew that she would not be going home with us when it was time for me to discharge, but we weren't exactly sure how long she would need to stay. In the meantime, we were happily spending lots of time getting to know Layla. 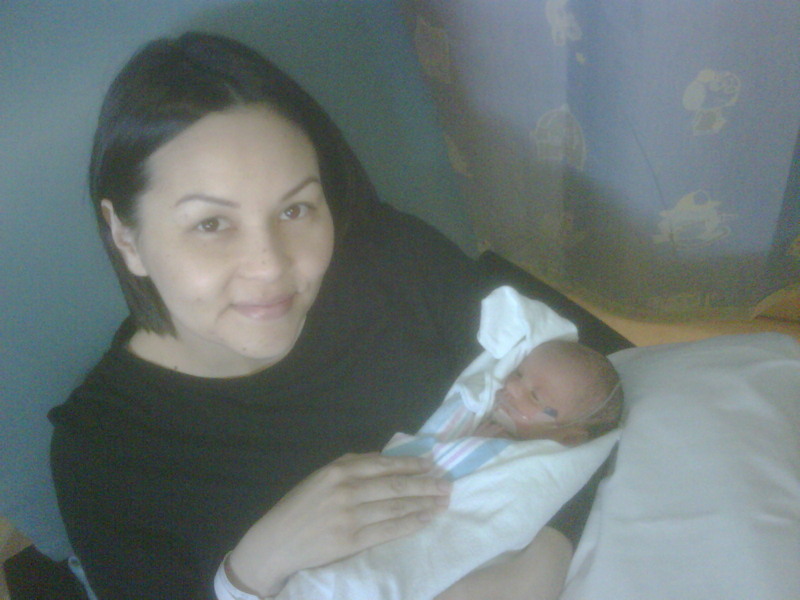 Layla was tiny and had a few struggles herself, fortunately, none of which landed her in the NICU. Our main focus with her was keeping her body temperature and weight up. She wore several layers of clothing and stayed double-swaddled at all times. We really were enjoying taking care of her and introducing her to all of our friends that came to visit. When Sunday rolled around, we were super excited to take her home, but also dreading leaving her sister at the hospital...definitely bittersweet. Our first week at home with Layla was quite crazy. We were trying to get used to all the new things that a baby brings to a home, while at the same time, continuing to visit Jenna in the NICU as much as possible. Layla was adjusting well and, shockingly, so was our dog, Toby. Like I said earlier, Jenna continued to show progress every single day. After 6 days of being at home with one baby, we were given the amazing news that Jenna would be coming home. We were thrilled!!! March 20, 2010 will always be a special day for our family...it was the day we all finally got to be together. It was awesome seeing Layla and Jenna reunite...they are definitely meant to be together! I'm happy to report that we are all doing great and enjoying this so much! It's crazy how much we love these girls. Don't get me wrong, there are tough days, but being together as a family is the most important thing to us and we wouldn't trade it for the world. Happy 2 Week Birthday, Layla and Jenna! Would you be offended if these were the words, or shall I say letters, that first come out of your doctor's mouth when she sees you waddle by? Luckily, I'm not in denial...I know I'm ginormous (another word she used) and I actually appreciate her confirming my thoughts instead of trying to convince me, "You're so tiny!" or "You're all baby!" More importantly, though, the girls are doing great! It's been over 10 weeks since I was put on bed rest and I've managed to keep these babies inside for 34 weeks! Laying in the hospital bed over the holidays, I never in my wildest dreams thought we would/could ever make it this far, so for this, I am extremely grateful. We're hoping to hold on for another couple of weeks. Can you even imagine what I'll look like then? OMG!